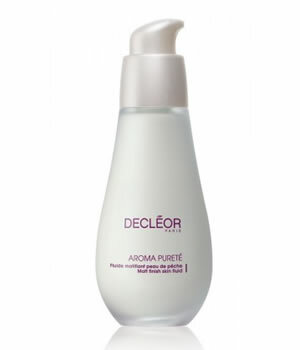 Decleor Aroma Purete Velvet Mattifying Fluid purifies and oxygenates cells, this light, non-oily fluid with a fresh green scent has been scientifically developed to help oilier skin types.This unique formulation contains a Pure Oxygenating Complex featuring Yeast Extract, Marine Glycogene and Vitamin C, which boosts the skin’s ability to breathe again, improves cellular activity and restores a beautifully radiant glow. Skin looks instantly mattified* and shine is controlled all day long leaving you with a soft, refined complexion that feels fresh and perfectly hydrated. Active ingredients include Ylang Ylang Essential Oil and White Water Lily Extracts to purify, cleanse and soothe, Chrono-Purity Zinc Spheres to target and regulate sebum production, and P-Refiner Technology to tighten pores.Suitable for combination or oily skin types. For best results, apply in the morning to a clean face and neck after Aromessence™ Ylang Ylang. *After just one use, 94% of women felt their skin was immediately mattified.